This sweet and savory salad is hearty enough to be a main dish, but while the grill is fired up, consider adding your favorite meat prepared with our Basic Balsamic Marinade. Don’t feel like grilling? Broil the radicchio instead. We love using lentils for their low cost, ease of cooking and as a great source of protein, fiber, and folate. Folate is an essential nutrient for the production of RNA and DNA to make new cells, especially important for pregnant/nursing women and growing children. Adapt this recipe in the winter with dried cherries instead of fresh peaches. Recipe courtesy of Lauren Chandler, barre3’s culinary wellness expert. Prepare the grill, bringing it to medium-heat and oiling the grill rack. While the grill is preheating, prepare the other ingredients. Pour the lentils into a small pot and sift through them, removing any debris. Rinse the lentils and drain, then return to the pot and cover with about 3 inches of water. Bring lentils to a boil, then reduce to a simmer and cook for about 20-25 minutes until tender, but not falling apart. Drain, rinse with cool water, and set aside. Place the radicchio in a large bowl. 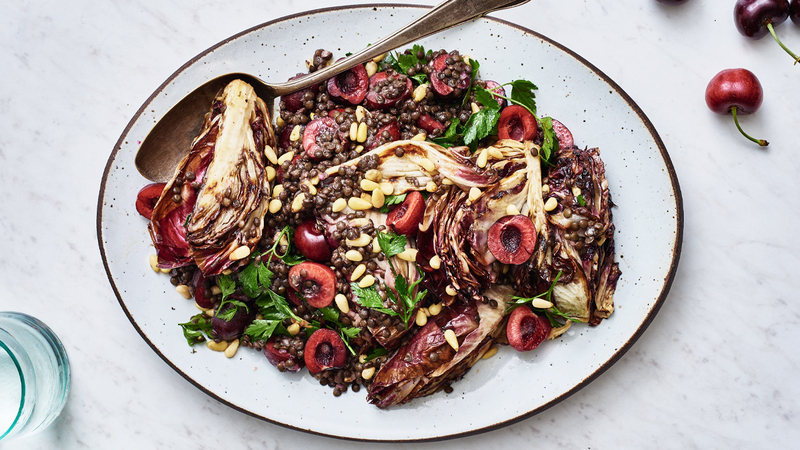 Drizzle 3 tablespoons of oil over the cut sides of the radicchio, season with salt and pepper and gently toss to evenly coat. Place the radicchio cut sides down on the grill and cook, turning frequently, for around 6-8 minutes until the edges of the leaves are browned and the core is fork-tender. Transfer back into the bowl and add the cherries and the lentils. In a small bowl, whisk together the remaining oil, honey, shallot, vinegar, and mustard. Drizzle over the salad and gently toss to coat, seasoning with salt and pepper to taste. Transfer to a serving platter or divide evenly among plates and garnish with the nuts and herbs. Best served immediately.